Many preservice teachers report having had little exposure on the use of technology in the teaching and learning of mathematics. Without guidance on the appropriate use of technology, prospective teachers are left to form their own beliefs about what is appropriate technology use. 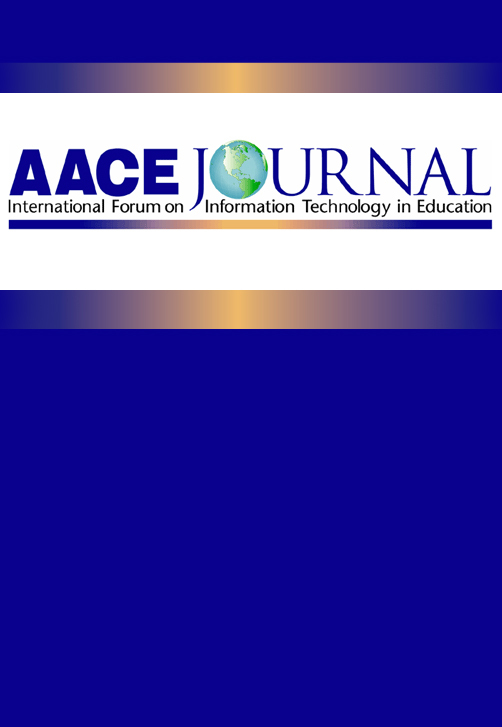 This study assessed preservice teacher beliefs and conceptions of appropriate use of technology in mathematics teaching and learning. Findings indicate that preservice teachers generally did not share the vision of appropriate use of technology in Mathematics (as provided in the National Council of Teachers of Mathematics [NCTM] Standards) to support and facilitate conceptual development, exploration, reasoning and problem solving. Preservice teachers' beliefs and conceptions of appropriate technology use were limited to the use of technology as computational tools and for checking accuracy of these computations. Evidence from this study suggests a lack of understanding of technology as powerful tools to help students gain knowledge, skills, and appreciation of mathematics. Wachira, P., Keengwe, J. & Onchwari, G. (2008). Mathematics Preservice Teachers’ Beliefs and Conceptions of Appropriate Technology Use. AACE Journal, 16 (3), 293-306. Chesapeake, VA: Association for the Advancement of Computing in Education (AACE). Retrieved April 19, 2019 from https://www.learntechlib.org/primary/p/26142/. Albee, J.J. (2003). A study of preservice elementary teachers’ technology skill preparedness and examples of how i t can be increased. Journal of Technology and Teacher Education, 11(1), 53-71. Ball, D.L. (1990). The mathematical understandings that prospective teachers bring to teacher education. Elementary School Journal, 90, 449-466. Cradler, J., McNabb, M., & Freeman, M. (2002). How does technology in-f luence student learning? Learning and Leading withTechnology, 29(8), 46-49. Creswell, J.W. (2002). Educational research: Planning, conducting, and evaluating quantitative and qualitative research. Upper Saddle River, NJ: Merrill Prentice Hall. Fleener, M. (1995). A survey of mathematics teachers’ attitudes about calculators: The impact of philosophical orientation. Journal of Computers in Mathematics and Science Teaching, 14(4), 481-498. Gado, I. (2004). Developing inquiry-based instruction through handhe ldbased laboratories: preservice teachers’ attitude and self-efficacy. Final Report for Gado’s Technology Grant. Cleveland, OH : Cleveland State University. Huang, S.Y.L., & Waxman, H.C. (1996). Classroom observations of middle schools tuden ts’ technology use in mathematics. School Science and Mathematics, 96(10), 28-34. Milou, E. (1999). The graphing calculator: A survey of usage. School Science and Mathematics, 93(3), 133-140. Mullen, L. (2001). Beyond infusion: Preservice students’ understandings about educational technologies for teaching and learning. Journal of Technology and Teacher Education, 9(3), 447-466. National Council for Accreditation of Teacher Education (2001). Technology and the new professional teacher: Preparing for the 21st century classroom. Washington DC : Author. National Council of Teachers of Mathematics. (1998). Calculators and the education of youth. Position Statement. Reston, VA: Author. Norton, S., McRobbie, C.J. & Cooper, T.J. (2000). Exploring secondary mathematics teachers’ reasons for not using computer in their teaching: Five case studies. Journal of Research on Technology in Education, 33(1). Pope, M., Hare, D., & Howard, E. (2002). Technology integration: Closing the gap between what preserviceteachers are taught and what they can do. Journal of Technology in Teacher Education, 10(2), 191-203. Quinn, R.J. (1998). Technology: Preservice teachers’ beliefs and the influence of a mathematics methods course. The ClearingHouse, 71(6), 375-377. Sandholtz, J.H., Ringstaff, C., & Dwyer, D.C. (2000). The evolution of instruction in technology-rich classrooms. In R.D. Pea (Ed. ), Technology and learning. San Francisco: Jossey-Bass. Thomson, A. (1992). Teachers’ beliefs and conceptions: A synthesis of the research. In D.A. Grouws (Ed. ), Handbook of research in mathematics teaching and learning (pp. 127-146). New York: Macmillan. Walen, S.B., Williams, S.R., & Garner, B.E. (2003). Preservice teachers learning mathematics using calculators: A failure to connect current and future practice. Teaching and Teacher Education, 19(4), 445-62.